BURNABY, B.C. 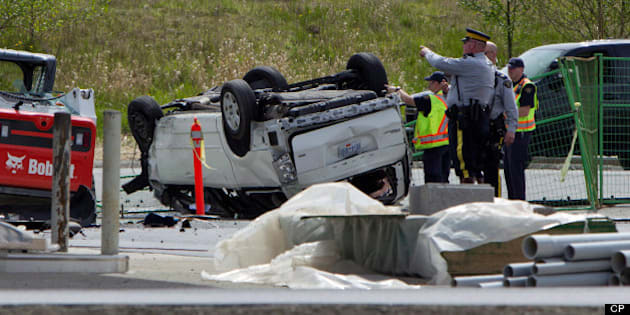 - Toxicology tests confirm that drugs or alcohol were not factors in a Surrey, B.C., vehicle crash that claimed the lives of six people. Fraser Regional Coroner Vincent Stancato says test results received show no indication of impairment from alcohol, illicit drugs or prescription medications in the blood of Daniel Gore. He was the driver and only occupant in a van that ran a red light and hit a car broadside in a Surrey intersection on April 28. All five people in the other car — three women and two children from the same family — were killed. Gore, who died in the hospital seven days after the crash, was diagnosed with a serious medical condition unrelated to the injuries he received in the crash. The coroner's service says now that impairment has been ruled out as a factor in the crash, it will continue to investigate the cause of the collision.